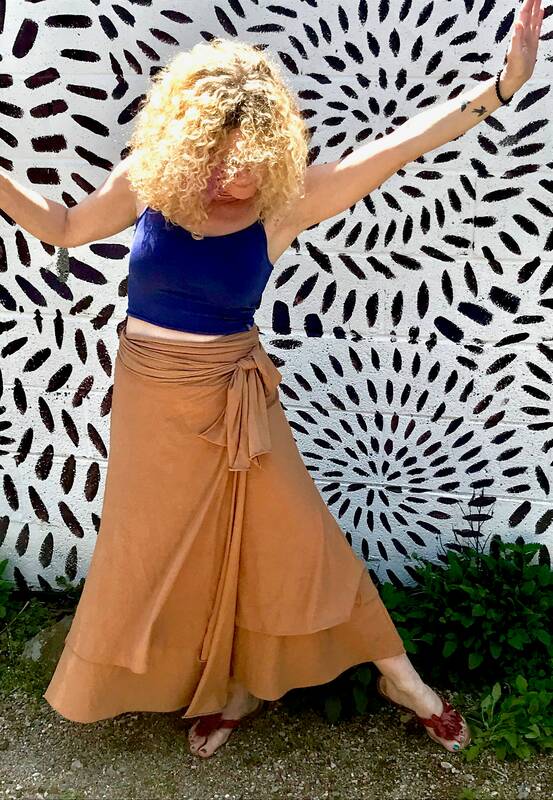 Made of the finest and softest featherweight organic cotton, milled locally in South Carolina, Surya Leela's Saraswati Wrap Skirt will make you feel like the wise and wonderful Goddess you are - flowing, fabulous, and free - riding the wave of serenity. 00% organic cotton double layer wrap skirt with a fanciful and elegant tie waistband is a sensual song of the spirit, natural and sublime. 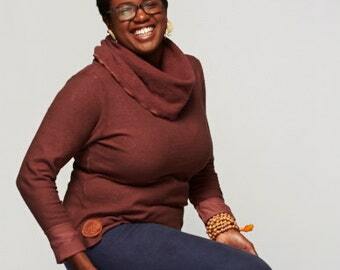 Easy to wear alone or layered over leggings, adorned simply by your beautiful body. Bottom layer is ankle length, about 34" from waist. Top layer hem rises 6" to rest at 28" from waist. Length can be cut to your specifications if you are taller or shorter. Model here is 5"4" tall, 125 lbs., wearing a size Small in color Cinnamon. Featherweight organic cotton jersey. Linen patch. Excellent drape and durability. Soft, breathable, yet warm in cooler weather. In the spirit of flexibility and sustainability your garment is made to order. You may choose a basic size or a custom fit according to your specific measurements. Please SEE THE BASIC SIZING CHART IN THE PHOTOS ABOVE. All items are garment-dyed in small batches unless un-dyed, so please be aware that variations often occur. This is part of the beauty of garment-dying, small-batch dying, hand-dying, lo-impact dying, procion-dying, eco-friendly dying, custom-dying… you will enjoy knowing that your items are each a uniquely crafted piece of clothing that will last for many years. Please see PHOTO ABOVE for color choices. Some names have been streamlined, like Red or Brown. Please let me know if you have questions. LION LEELA Logo and all other patches are stamped by hand on linen. If you want an alternate patch or no patch, let me know in the "note to seller." Your garment will be made with the most excellent quality natural fiber fabrics and organic cotton thread, securely sewn with a heavy duty 4-thread JUKI Industrial Serger to ensure long and enjoyable wear. Machine-wash or Hand-wash Gentle using cool or warm water and a mild, phosphate-free detergent. Your garment has been pre-shrunk in the dying process. Drying on Low or Medium till damp is recommended, then air dry until completely dry. Colors should not bleed, but wash separately the first time, then with like colors in the future. Remove clothes from the washer to dry as soon as the cycle is complete. For shipping information, returns, exchanges and alterations please visit Surya Leela’s policy page.